ROCKIN' OUT: A new Creedence Clearwater Revival tribute show will bring the rock n' roll vibes back to Geelong on Saturday. A new Creedence Clearwater Revival tribute show will hit Geelong for the first time on Saturday night. 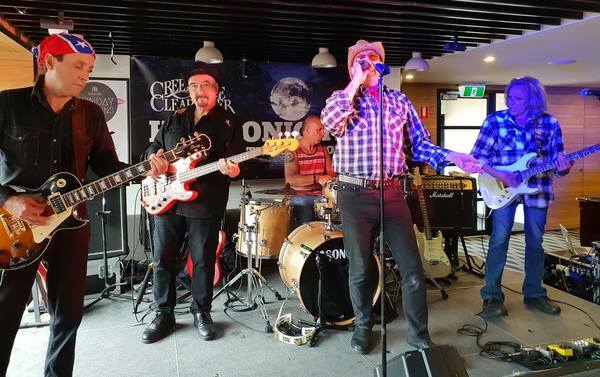 Local fans of the iconic ’70s rock band will get the chance to relive the Credence sound when tribute act Hey Tonight graces the stage at North Geelong’s Sphinx Hotel. Lead vocalist of the Melbourne-based act Andy Baker said the “power-packed” show was “pretty close to the real deal”. “Not only do we replicate their southern rock sound, but we look the part, too,” he told the Indy. Baker, who grew up listening to Creedence’s music, described lead singer John Forgety as his “music idol“. Baker first considered creating the show “years ago” but formed the band only last year after receiving “big demand for it”. “It’s been fantastic so far. We’ve played in front of packed houses and got great responses,” Baker said. The 60-year-old had “rediscovered” himself through the tribute act. “It gives me a lot of enjoyment, the songs are great to sing and the music suits my vocal style,” he said. Patrons could expect to hear classic Creedence hits as well as songs from Fogarty’s solo productions, Baker said. “If you want to enjoy a fun night of good, old-school rock and country music, you’ll get that with us,” he declared. Baker said his bandmates were Bruce Mountjoy and Frank Cano on guitars, bassist Max Coleman and drummer Adam Edwards. One of the best aspects to the show was “seeing people of all ages sing along to the songs”, Baker. “We’ve found that it’s not just the baby boomers getting into it but it’s the younger generation, too,” he said. Baker said he had been entertaining audiences through other tribute acts for decades, so he was excited about bringing his new show to Geelong.